One of the six famous communities (next to Listrac-Médoc. Margaux. Moulis. Pauillac and Saint-Estèphe ) within the French area Haut-Médoc, which are their own appellations and may carry the community name on the bottle label. For community Abellation with about 900 hectares of vineyards also counts the neighboring community Beychevelle. A special feature is that there is a 16-hectare enclave in the municipality, whose wines may bear the designation of origin Pauillac. Worth mentioning is also the fact that historically the famous Château Latour (Pauillac) would actually belong to Saint-Julien. The soils consist of a thin gravel layer with sandy loess on ferrous subsoil with marl and gravel. 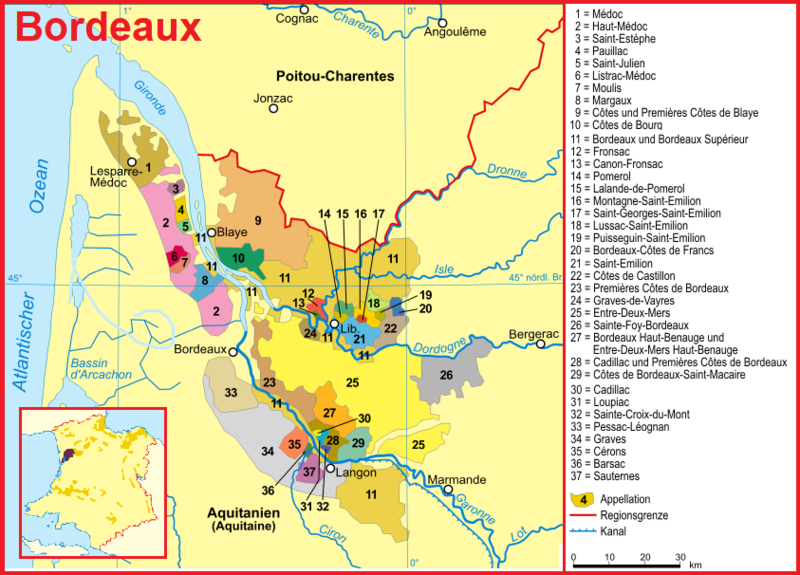 Here are eleven of the 61 châteaux (with 85% of the municipal area), which are among the famous and still significant Bordeaux Classification 1855 were included in the list of the most expensive and qualitatively best wines. These are the five Deuxièmes (2nd place) Château Ducru-Beaucaillou. Château Gruaud-Larose. Château Léoville-Barton. Château Léoville-Las-Cases and Château Léoville-Poyferré, the two Troisièmes (3rd place) Château Lagrange and Château Langoa-Barton, as well as the four Quatrièmes (4th place) Château Beychevelle. Château Branaire-Ducru. Château Saint-Pierre and Château Talbot (See a list of all 61 wineries under Médoc ). The Château Léoville-Las-Cases is one of the "Super-Seconds" which, according to experts, would create the Premier Cru Classé in a (theoretically) new classification. There are also cru-bourgeois wineries like Château Bel-Air. Château du Glana and Château Gloria, as well as many classified as Cru Artisan. The tannin-rich, long-lived red wines are in the style between those from Margaux (finesse) and Pauillac (or body fullness); they are characterized throughout the range by a consistently high quality.